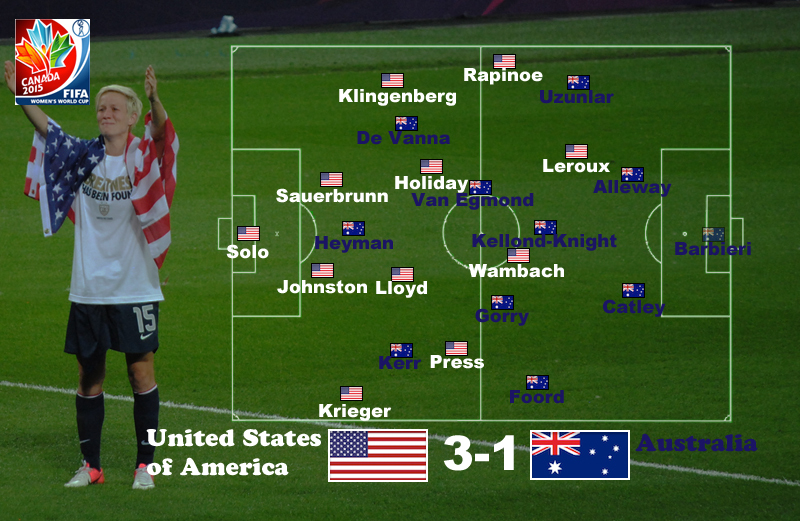 The US wore down a strong Australian team in a game they would likely have lost but for Hope Solo. Before the tournament started, I think I irritated a friend by suggesting that the US team were better athletes than they were football players, but this game was a perfect illustration of what I meant. Australia owned the first half, notwithstanding a flukey 12′ goal by Megan Rapinoe, redirected wickedly off Laura Alleway to give Melissa Barbieri no chance. Australia’s midfield three dominated Carli Lloyd and Lauren Holiday, and their fluent attack gave the US fits. Immediately after the US goal, an unmarked Samantha Kerr ran onto an Elise Kellond-Knight pass for a volley that was only kept out by a brilliant save on Solo’s part. It wasn’t her first, having pushed an Emily Van Egmond shot onto the crossbar at 5′; nor her last, as a 45′ Servet Unzular free kick unexpectedly came all the way through to an alert Solo. By contrast with Rapinoe’s opener, Australia’s 27′ goal was an intricately choreographed thing of beauty, involving four players working in unison to simply outplay the US. Goalscorer Lisa De Vanna troubled the US throughout with her pace, but her goal was served up on a platter courtesy of a fantastic team play (and, it must be said, a terrible defensive lapse by a ball-watching Ali Krieger). In comparison to Australia’s thoughtful control of midfield and varied, probing attack, the US continues to employ the same tactics as Stoke City, playing a direct game up the flanks, launching long balls for an aging Abby Wambach, and hoping to score from set pieces. Wambach and Sydney Leroux look like a classic target woman and second striker to play off her, but they had virtually no connection in this game. While it’s true that this was a poor first half performance for the US, it also demonstrated their tactical limitations against talented opposition. Those limitations are particularly troubling given Wambach’s noticeably rusty game, missing two headers that you couldn’t imagine staying out of the net four years ago. But what the US did do, even in the first half, was to make Australia work hard. Really hard. That began to tell late in the first half, and although Australia came out strong to open the second, culminating in a lovely 50′ chance for Kerr created by a Katrina Gorry through-ball, they simply could not match the US fitness level. That was especially true on th hot artificial turf (if you’ve never played on turf, check out the slow motion replays for the arcing black trails of vulcanized rubber dragged up by players’ feet; it’s a very cool visual effect, but all that underlying rubber soaks up and radiates heat). The progression of the US’s second half goals demonstrated the fitness gap. By 61′, they were able to score a goal not unlike Australia’s, Leroux slipping behind the defense on the left and cutting the ball back for an unmarked Press to score. Rapinoe’s 78′ goal was even more clearly a sign of Australian exhaustion. Center back Alleway had advanced to spur the attack, but gave the ball away and struggled to get back into position as Rapinoe shot down the left flank. As a result, she didn’t close Rapinoe down, allowing the American to take an admittedly magnificent shot, securing victory. Saying that the US won because of superior fitness more than from their tactical acumen is not to suggest they are undeserving of their success. Football is an athletic endeavor, and being a fitter, faster, and stronger side gains an entirely legitimate advantage. Moreover, the US fitness in this game allowed them to deploy their footballing abilities for a full 90′, whereas Australia was unable to maintain the high level of their first half performance. I should perhaps add that the top US players do have individual talent in abundance, though none of them are at the highest level of players like Brazil’s Marta, France’s Louisa Nécib and Eugenie Le Sommer, or Germany’s (sadly, injured) Nadine Kessler. Given the 3-3 result between Group D opponents, Sweden and Nigeria, this win sets the US up nicely for the remainder of group play. It will certainly allow for more leeway going into the key second group game against Sweden.